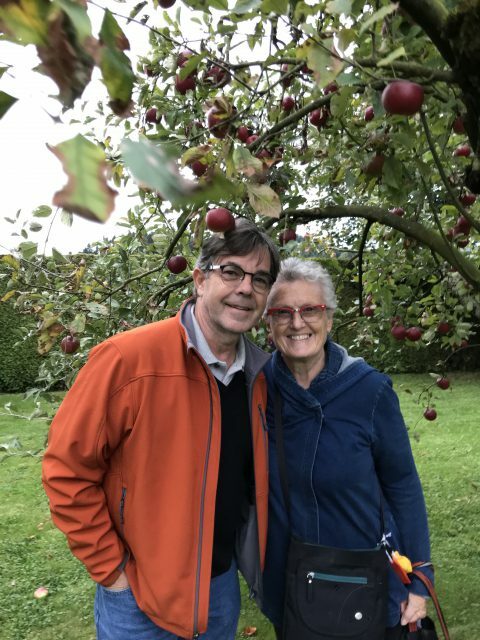 Under the apple tree with my best friend and travel partner. We’ve been traveling now for over a month, not a lot of time in the overall time we’ll be traveling, but enough to have learned a few things already, and figured out what we’re doing right and where we can make changes. Although we’re seeing and experiencing a lot, we also spend time on the usual everyday stuff we did before we started on our travels. Brett and I make a good travel team. We got along well before setting off, and that’s continued thankfully. There’s always something to plan, something to talk about, something to dream about. The only time we seem to snip at each other is when we’re tired and have arrived at a new place and have to figure out where we’re going. Brett is “utility guy” (carrying heavy bags and keeping track of our spending), but also does the driving when necessary and takes care of other heavy chores. I still “manage the household,” making sure we have enough food and enough variety; that our living quarters stay tidy; that the laundry gets done, and all those other sorts of banal but important tasks that still take time. I also plan our activities for the day, or decide whether we’ll take a day off. Brett is a very “in the moment” person while I’m always thinking two steps ahead about what we’ll need and when we’ll need it, but with our strengths pooled everything has been going smoothly so far. Laundry is one of the more mundane parts of travel. We go to the laundromat here in Strasbourg once a week – it costs around $15 for two loads, but takes just a little over an hour. We’ve still only found a couple of things we wish we had brought along with us and didn’t. Ziploc bags are at top of the list, but we’re hanging in there so far with what we have. We did score two big plastic carry bags at one grocery store which have turned out to be perfect for hauling laundry to and from the laundromat here in Strasbourg. We also never thought to bring wash cloths, but had to go out and find some because a few of the homes where we’ve stayed do not have them for some reason. We headed to a Macy’s-like department store in central Strasbourg and found just what we wanted on their sale table! It’s been great being able to hang up our clothes for a while versus digging them out of a suitcase each day. Clothes-wise it seems so far like we brought just the right amount and mix of things to wear. Only one pair of shoes I brought along haven’t worked out – they fit and look good, but are not comfortable for walking around which is critical. I’m not sure right now whether I’ll hold on to them or not. One issue we’re having with clothes though is the frequently changing weather – it’s been swinging, sometimes wildly, between warm and cold. It was chilly in Switzerland, but in the upper 70s when we got back to Strasbourg, and is forecast to be in the 80s when we go to Bordeaux! It can drive us crazy at times trying to figure out what can be unpacked and what should stay in our suitcases. We’ve found we’re good at adapting to our frequently changing situations, and can make do with whatever exists or doesn’t where we’re staying. Some houses have lots of cookware, appliances, and other amenities while others not so much, but we’ve been able to make it work for us wherever we are. The only thing we hope for whenever we check in somewhere is a comfortable, firm bed with clean sheets and so far we’ve gotten that in every home. We’ve found we like doing things and figuring out things on our own more than we like taking tours. We sometimes take the free walking tours available to learn about the history of a place and get ourselves oriented, but otherwise we like figuring out transportation and such and then setting out together, armed only with a map. We like learning about the history of a place, and I especially like checking out the architecture from old to new while Brett is interested more in mechanical and technical things (mills, machinery, etc.) and plants. We also enjoy dropping into stores, even ones that we have back in the States (like H&M, Uniqlo, etc.) to check them out and see what’s the same and what’s different, what prices are like and so forth, but we rarely if ever buy anything (boulangeries are the exception to that rule!). Cookies! 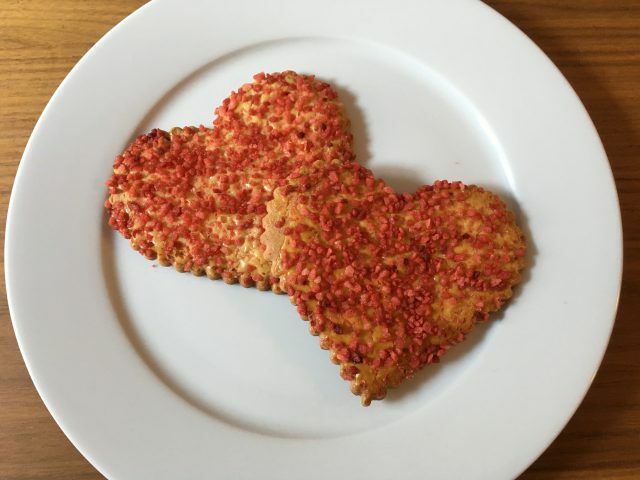 These are sablés sucre from a boulangerie – a delicious and affordable treat! Our favorite treat on the road has turned out to be not chocolate but cookies! We had some good ones in Buenos Aires and Montevideo (coconut butter cookies to die for), but the ones we’ve found in French supermarkets have been fantastic, and affordable too. Many of the supermarket cookies here are the kind you’d have to go to a bakery to buy in the U.S. Although all have been tasty, our favorites right now are lemon sablés (shortbread), florentines, and petite buerre. We like to carry the petite buerre for travel between destinations because they’re somewhat like a slightly sweet cracker. Actually, none of the cookies is overly sweet which may be why we like them so much. I have to thank the Great British Baking Show for introducing me to so many of the cookie varieties that are available here. Knock on wood, but we have both stayed in good health so far. No colds, no upset stomachs, nothing that has stopped us from getting up and out each day. My back still gives me problems from time to time as does the bursitis in my right hip, and there’s no rhyme or reason to when or why it flares up when it does. For the most part though it’s thankfully been manageable. I tried to follow the news in the U.S. for a while but finally gave up – I’m happier not knowing what’s going on for now. The girls and our son have been great about staying in touch thanks to Facebook, Messenger, Instagram, etc. as have friends (and readers!). Our T-Mobile plan lets us text for free, and we also get free data (although it’s incredibly slow), but we have to pay for phone calls so those don’t happen (we can video message via Messenger though). Wifi here has its ups and downs, mostly ups thankfully but we have had problems in a couple of places keeping a connection which can be frustrating. So far it’s all been good – nothing has been too challenging. We’re enjoying our life on the road, and especially our extended stay in Strasbourg right now. Still, we’re starting to look forward to being in Bordeaux in another a week. The only part both of us is dreading is having to repack our suitcases later this week as well as having to move them around once again – it’s been so nice being able to be “unpacked” for a while. But, that’s our life these days, and we do what we gotta do! Love reading about your travels – so glad things are going well! Thank you! Sometimes I wonder if I’m posting too much (either on the blog or Instagram) but I’ve gone back through them and they’re a wonderful way for me to remember what we’ve done. Fingers are crossed that all continues to go well from here on out. Hi Tommy! We do have Skype installed – it’s been good for toll-free calls back to the U.S. but otherwise we’ve avoided calling. For talking with the kids with all their different schedules, we’ve found it’s more convenient for them to ping us via Messenger to let us know they have time to chat and then we message back either by calling or texting. It took us a while though to get all the time differences sorted out. We’ve got two who are on EST, one on PST, and one in Japan so it can get crazy! I do not appreciate getting called at 4:00 a.m. in the morning! On our last trip, I bought microfiber wash cloths to pack, because I had missed them so much on our previous trip. I guess Europeans just don’t use them much. I’m lost without one and was really happy to have them. Glad you found some! Also, I think you’ve helped me convince my hubby to use AirBnB when we travel. I’ve used them myself and with my daughters, but he traveled for work and always wants to stay in hotels. Needless to say, now that we’re retired AirBnB is a much more practical option. 🙂 So, thanks! Trying to get from our destination airport or train station to our lodgings is typically the biggest hassle we have. We do a lot of research before arriving on how to get to our place, ask the owners, etc. and yet there still seem to be some small problem compounded by being tired and having to deal with our suitcases. So, we snip at each other, but no big fights, and the minute we arrive at our home we’re back to being our cheery selves again. Thanks for the tip about the microfiber washcloths – I may look for them when we’re in Portland. Washcloths were just one of those things we assumed would be available. The ones we bought here in France are more like mitts! We are hooked on staying in Airbnb rentals – so far our experiences have all been positive, and it’s been so much more affordable than hotels. At times I wish we had had a bigger budget for some fancier or bigger places, but so far everything has been OK and worked out well (especially the location – I got that right so far). Here are the ones I bought. They’re soft, the perfect size (IMO), and they dry really quickly, so I never had to pack them wet the next morning. Thanks for the link! I will look for them in Portland, but will also have time to order from Amazon if necessary while we’re there. The ones I bought are rather heavy terrycloth – these would obviously dry much more quickly. Ok, for ziploc bags at a very reasonable price, you could head to IKEA Strasbourg. I will post another comment with links to both the store and also the ISTAD ziploc bags. They have 6 different sizes and they come in packs with 2 of each size put in together. 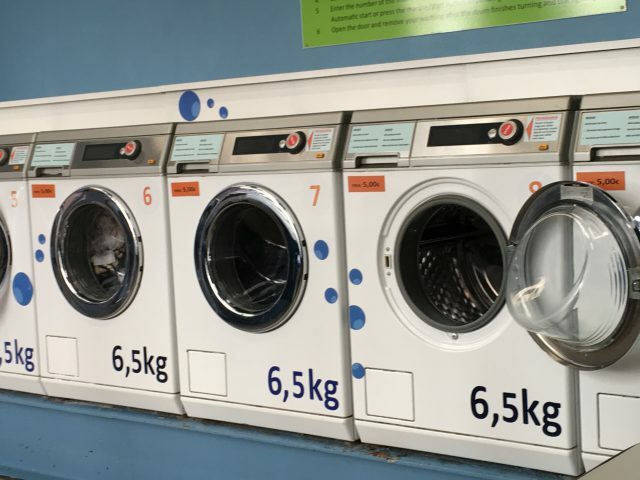 For travelling I most love the green set – a 6 litre bag is perfect for holding the dirty clothes separate from the clean ones until you can get to the laundromat, we usually allocate one bag to each of us. You can pack all your stuff in and then one of you sits on the bag to push out all the air while the other one tries to zip it up. The red ones are smaller, I use them a lot for toiletries. https://www.ikea.com/fr/fr/store/strasbourg/restaurant2 <– restaurant prices and options. We looked up the IKEA store here, but it’s too far away from where we’re staying (there’s an Aldi right next door too!). We checked out the location for the IKEA store here in Strasbourg, but we don’t have a car and otherwise it would require a one-mile walk to and from the nearest public transportation stop. Oh well – I think we’re just going to have to break down and buy some in one of the French markets (they’re not cheap). We will definitely be stocking up when we’re back in Portland. I’m also sick about misplacing the beeswax wraps I bought to bring along – we would not be having these problems now with food storage. We are planning to go to IKEA when we’re in Portland to pick up some of the frozen meatballs, cream gravy and lingonberry jelly to have while we’re there. We love those meatballs! And yes, that would be a good place to look for washcloths! It also seems like IKEA has free wifi. I don’t know if they have that here, I have never tried to use it. Looking on the map it seems like there is quite a bit of interest to explore nearby, but it looks like the public transportation is not especially close by. The organic shop across the carpark – Côté Nature – looks like it is worth a wander, next to that is an Aldi. there is a cheese shop and a few other interesting looking places. We use Kakao Talk for free messaging, video calls and texts. I don’t have Facebook on my phone, I don’t like those little messenger popup profile photos, it was freaking me out quite a bit. We have two really nice organic shops close to our apartment – we were just in one yesterday to pick up a couple of ready-made meals (ratatouille and a choucroute quiche). We get all our produce from those markets (which means no plastic), and they both have good cheese selections. Facebook Messenger has been working well for us for most things. I actually like the little pop-up pictures because I can quickly see who has seen any messages we’ve sent, or which one of the kids is messaging us. Regardless, you have me pining to return to Europe. We do have plans to spend the spring in Spain in 2020, but that’s a long time away. So enjoying living vicariously through you in the interim! We paid for taxis in Buenos Aires, Montevideo and Paris because we were tired (i.e. exhausted) and knew it was no time to get to our destination “on the cheap.” Every penny we paid was completely worth it. Here in Strasbourg we could easily take the tram, but Brett picked the wrong station with L’Hopital in its name and we started out in the wrong direction. Lesson learned: talk to each other before setting out to make sure we agree on the destination! We are planning to do a day trip out to St. Emilion when we’re in Bordeaux, to poke around and do a little tasting. I cannot drink red wine though, so it may only be Brett doing the tasting. There was a interesting Airbnb tasting experience offered that we were interested in, but we had no way to get to the destination (and we read that public transportation to the site was NOT a good option). We are loving our time in France. Brett had been to Cannes, but everything we’ve seen this time has been new for both of us, and we’ve enjoyed every minute of it. We’ll be sad to leave Strasbourg next week – we have fallen in love with this city! Laura, if memory serves, the white wines of Bordeaux are only slightly less famous than the reds. You’ll have no problems finding lots of them, I’m quite sure. I asked Brett this morning if he thought we should cut back on the wine and his answer was, “Are you kidding?” Even the cheap stuff is good here. We’re greatly looking forward to Bordeaux! So important to be traveling with your BFF!! LOL!!! We too can get snipy when tired or over stressed due to travel, but at the end of the day in reflection we simply laugh at it. Our getting snippy with each other never lasts long, and only happens when we’re tired or confused. We are really having a great time together though – after all these years we never run out of things to talk about, and know when to give the other some space, and so forth.